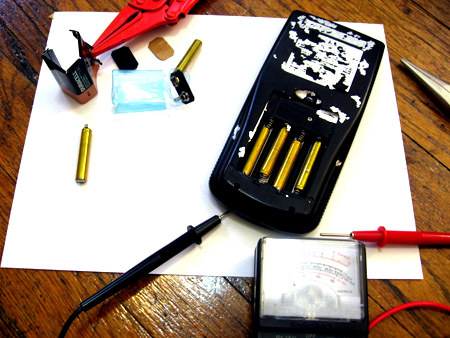 Kipkay over at Metacafe has posted videos showing how you can take apart a 9V battery and use the cells as AAAA or AAA batteries (he has a similar trick for 12V -> 1.5V button batteries. I have played with batteries a lot in my life and never knew this. There was some speculation on reddit that it was a hoax of some kind, so as a good sciencer (like a scientist, but we don’t get the lab coats) who really didn’t want to get started on the morning chores, I decided to try it myself with a new 9V I had sitting around. I learned a couple useful things. Duracell batteries are harder to open than the video implies. My dainty needle-nose pliers weren’t enough — I had to go find larger clampy ones. The edges of the case are also sharp. This would be very tricky to do in a car somewhere without tools. He tells us these are AAAA cells, which makes sense. You know, I didn’t even know AAAA cells existed until I encountered a tablet stylus that used them. The handy thing is that they can double for AAA batteries in most cases — they just won’t last as long. 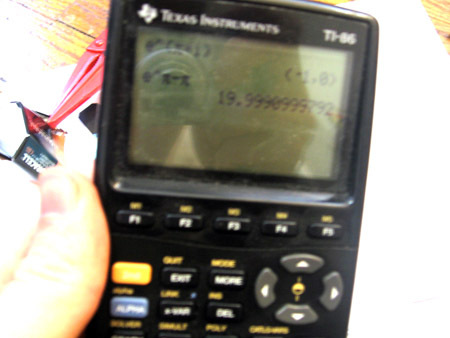 I decided to test them in my TI-86. One important thing he doesn’t mention is that there’s no reliable way to tell the polarity once you’ve disconnected them, so mark them somehow as you take them apart. If you’re just guessing, you’ve got 16 combinations to work through. I didn’t think about this, so I cut them apart and folded over the remaining half-tabs on each end, then tested them all with a multimeter to get the polarity (my digital multimeter is missing, so I couldn’t get exact volt-readings). I put them in the calculator. It didn’t turn on. I added a bit of aluminum foil at the contacts to make sure they were all touching. So, in conclusion: This is a decent way to get AAA batteries in a pinch for a bit less than what they cost in the store, although I don’t use 9Vs for much, so situations where this is helpful are gonna be a bit rare. AAAs in a pack of 8 usually go for about $0.70 a battery, 9Vs for around $2 — so $0.33 per AAA. AAAA batteries are rare enough, and marked up enough, that if you have something that uses them this could be a worthwhile main source. That’s pretty cool. Haven’s seen this before and I think I am gonna try it. Gonna go get a new battery right now. Don’t be a dork! Buy the batteries you need and go on with your life. Save yourself, it’s too late for me. If you look closely at the battery, you will see a indentation all the way around one end of the battery. This is a reliable way to find negative. 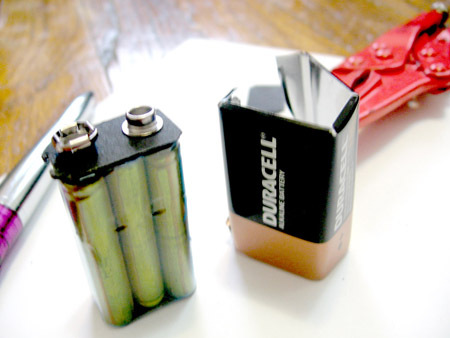 Where else can you find rechargeable AAAA batteries ! Great find folks. Nice and detailed post dude. Also I think the positive terminal has a ring at the end which can remove ambiguity. @Bilal: the negative end is actually the one with the ring around it. @xkcd: thank you do much for this post. 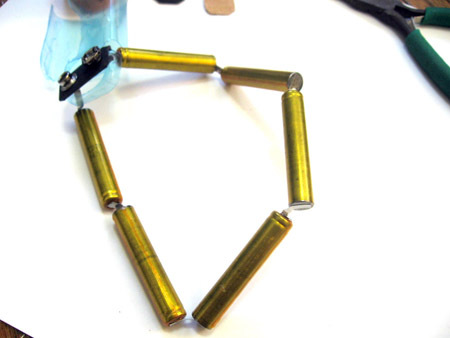 I’m out of AAAs at the moment and I needed to know if it was safe to take apart a Duracell. Thanks again! 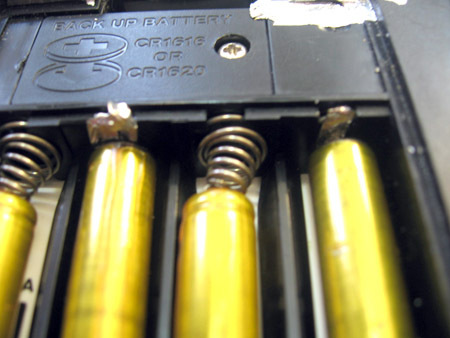 It’s important to realize that not all 9v batteries have AAAA cells inside. I opened a Duracell 9v battery today, and found what seems to be a glass container with a stack of compartments containing electrolyte. The cells do contain caustic agents, so if you’re taking a 9V battery apart, wear gloves, and be careful not to damage the insides in case it turns out you have a cell stack instead of a set of AAAA batteries. I’d like to try this one except use something like a D battery and daisychain those up for some more power. Especially on some small remote controlled cars my son has which just don’t get enough juice from the AA’s. I’d like to power those things up. Worth a shot I guess. Probably won’t kill myself, maybe just start a small fire. The EMG 81 is a popular active humbucker guitar pickup manufactured by EMG, Inc.. It is usually considered a lead pickup for use in bridge position, paired with EMG 85 as a rhythm pickup in neck position (Zakk Wylde is famous for this configuration). It’s not uncommon, however, to see a guitar with two EMG 81s in both bridge and neck positions (for instance, Kirk Hammett’s EMG-KH21 pickup sets, which include 2 EMG 81 pickups for both neck and bridge positions). Nice one. I want to share my experience with you about alkaline 9v batteries. Usually when a 9V battery is depleted, I just open it up to see how many cells have completely discharged. And in 90% of the cases is just one single cell. The rest still have about 60-70 maybe 80% capacity left. This is because of cell mismatch at the factory or maybe done deliberately, I don’t know. This goes for all multi-cell batteries like A23 or 3LR12, 6V lantern batteries etc. This phenomenon can also be called the “weak link on the chain”. So, from now one, I want to stay away from 9V products. 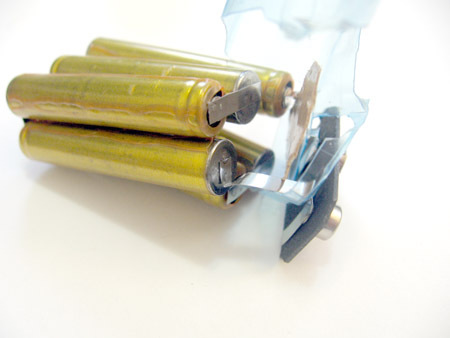 AAAA batteries have a capacity of 625 mAh whereas AAA batteries’ capacity is 1200 mAh. That means they’ll die 1.9 times faster than a AAA. So you actually end up spending more on batteries using this method. gracias por los servicios.. wisata pulau tidung. Ho amato molto leggere il tuo blog. E ‘stato scritto molto bene e semplice da capire. The picture shows the individual cells still connected in series with the 9 volt cap. The crimped end of the cell is connected to the (+) polarity and therefore should be the (+), (alternating polarities in series), the smooth / non-crimped end is the (-) end.